The idea of ​​opening such an institution has long existed among the Russian intelligentsia. The exhibition was collected in a very short time. Collectors of historical relics inspired the success of the exhibition in honor of the 200th anniversary of Peter I. Veterans of the Crimean War made their contribution. In large numbers, they transferred memorabilia, which later became part of the defense department of Sevastopol. For the storage of all these exhibits and the organization of the future exhibition required a building. Everything turned out as well as possible when the petition with the proposal to create a museum was presented to the emperor, who liked this idea. The date of its foundation is February 21, 1872, when, at the behest of Emperor Alexander II, the construction of a new building began. The authors of the construction were the famous architect Vladimir Sherwood and engineer Alexander Semenov. The Moscow City Duma decided to demolish the building of the main pharmacy, and allocate the vacated section for construction. For seven years, Sherwood changed the project four times. Semenov was engaged in the internal arrangement of rooms and a library. The building successfully embodied the style of old Russian architecture in combination with red brick. The building harmoniously fit into the general ensemble of the Red Square. In 1883, the museum received its first visitors. For a long time, scientists argued about the nature of the exposure. Some thought that it should consist exclusively of objects of history, others wanted to exhibit works of art related to history. However, after the institution was transferred to maintenance from the state treasury, the idea of ​​autocracy became the central theme. The first thing that greeted visitors was a family tree, consisting of 68 portraits of the family members of the emperor. The exhibition was planned to be placed in 47 halls, but by the time of the opening only 11 were ready, the rest were open at a later time. Dozens of windows appeared in the halls with a unique pattern and doors made to order from oak and pine. In the decoration of each room used mosaic, sculptures with heraldic symbols, small architectural forms. The historical museum went through hard times in 1917, when ignorant soldiers shouted that it was necessary to build a factory in the building, and “all this dung should be thrown out”. Only thanks to the efforts of Lunacharsky and Lenin was it possible to avoid the destruction of the exposition. At the very beginning of the war, it was decided to evacuate part of the values ​​in the Kazakh city of Kostanay. The State Historical Museum, despite regular bombings and a crack in the foundation of the building, was the only one in the capital that continued to work even during the siege of the city. In 1957, an expedition opened on the second floor of the State Historical Museum, covering events before the October Revolution. In Soviet times, the building was not repaired for a long time. For four decades, it has decayed, the work of electrical wiring was broken, and cracks appeared that hit most of the partitions. In addition, the details of the design and painting on the walls have suffered. With the advent of restructuring, the global renovation of the building began, which was completed only in 2002. 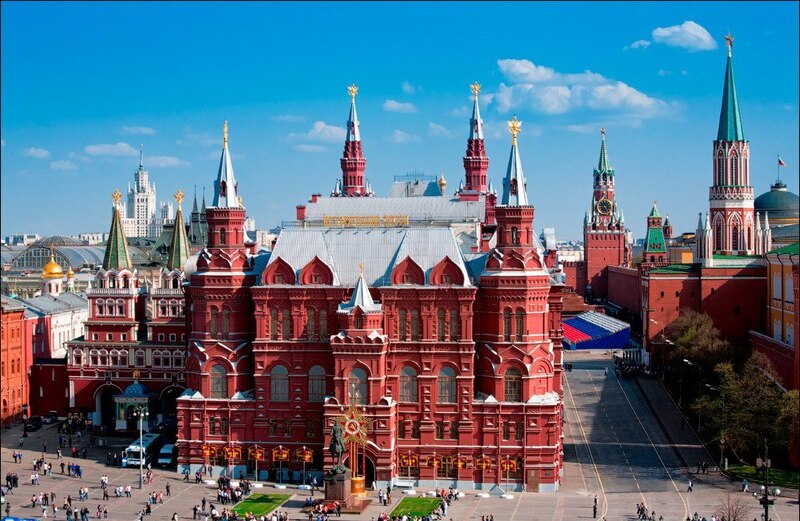 In 1990, the building of the State Historical Museum on Red Square was included in the UNESCO List of Cultural Heritage Sites. To date, the work of 40 halls of the institution is provided by a staff of 800 people. Crossing the threshold of the museum, visitors enter the front hallway, decorated with wall paintings and lions. As in previous times, guests are greeted by images of princes and emperors. The princes of Kiev are at the source of the tree, and the portrait of Alexander III completes the gallery, for the museum opened its doors for the first time. To the left of the Parade halls are located the halls from the 1st to the 21st. The exposition follows the chronology, each hall is a separate epoch. At the very beginning, it tells about the history of primitive society, in the center of the hall there is a canoe made from an oak trunk and found near Voronezh. The main attraction of the Bronze Age Hall is considered to be the Kolikho dolmen. In addition, there is a bronze idol, tools and jewelry. A separate room is devoted to the art of the Russian state of the early Middle Ages. The museum tells about the invasion of the Mongol-Tatars, the battle with the German knights and the Time of Troubles. Of particular value are the seal of Alexander Nevsky and his helmet. Most of the exposition of the 16-17 centuries is devoted to Russian culture. There are many icons framed in gold and silver, inlaid with precious stones. The place of honor is occupied by the globe brought by Peter Alekseevich from Western Europe. The building of the State Historical Museum has two floors. The upper part of the exhibition tells about the life of the state from the time of Peter I to Alexander III. In addition to the personal belongings of the royal family, there are documents and subjects testifying to the rapid development of the economy, politics and culture of Russia in the 18-19 centuries. A separate room is dedicated to the reign of Empress Catherine II. The second floor in the design is more restrained, but no less interesting for visitors. The fund of the museum is replenished mainly with donations from private collections. Every year thousands of items come from expeditions. The GIM fund today consists of almost 5 million objects and 14 million documentary exhibits. Only 0.5% of them are on display for visitors. The main part is located in special storage facilities where the humidity is maintained at 55% and the temperature is 18 degrees. The collections of the museum are divided and transferred to the jurisdiction of the following departments: archaeological, precious metals, Russian painting, numismatics, weapons, books, cartography and others. The Museum of History regularly holds exhibitions, for these purposes, use GIM lettered halls. The modern exposition presents an exhibition of gold products of various times and nationalities. Hall "A" tells about the metal of the gods – gold products in church culture. In Hall B, nuggets are displayed and the process of using precious metals in the manufacture of awards is reflected. And finally, the hall "B" – a collection of unique gold exhibits, collected around the world. The lettered halls can be accessed directly from the front porch. In addition to the permanent exhibition, temporary expositions work on the top floor. A branch of the historical museum is the museum of V.I. Lenin, whose funds are part of the GIM. The red brick building is considered a unique monument of Russian culture. Once the Moscow City Council was located here. The exposition, fully dedicated to the life and activities of the leader of the world proletariat, was closed, the Lenin Museum was virtually eliminated, and an exhibition in its place telling about the events of 1812 appeared. The official address of the museum: Red Square, house 1. By public transport to get to the GIM is easiest on the subway, it is the most affordable and fast form of transport. The most convenient way is to walk from Okhotny Ryad, Teatralnaya or Ploschad Revolyutsii stations, the journey time will take no more than 3 minutes – the museum is nearby. The entrance is located on the side of the Resurrection Gate and "Zero Kilometer". If you are in the heart of the Russian capital, have already visited the Church of St. Basil, the Museum of the Patriotic War of 1812 and the Chamber of Romanovs, you should certainly make a tour of the State Historical Museum. Mode of operation of the museum of history is very convenient. In the summer (from June 1 to August 31), its doors are open to visitors seven days a week from 10 to 21 hours, no days off. In 2019, only one summer day, according to the schedule, will become a day off for the museum – on August 7. In winter, the GIM is open every day, except Tuesday, the opening hours are slightly shorter – from 10 am to 6 pm, from 10 am to 9 pm on Friday and Saturday. It is worth paying attention to the fact that the cashier closes one hour before the end of the exhibition. The exhibition can be viewed independently or as part of the tour. Audio guide will cost 400 rubles. The ticket price for adult Russians will be 400 rubles. For foreigners, it is increased to 500 rubles. Children from 16 to 18 years old and students purchase a ticket at a reduced price of 150 rubles. For children under the age of 16, admission is free. Pensioners also have benefits, for them the price of a ticket is 150 rubles. Favorable offer exists for Russian families with two children, such a company can pass a total of 600 rubles. In order to capture the exhibits you like and to permanently leave in your memory the impressions of visiting the State Historical Museum in Moscow, you can use video shooting for free and take photos.